Every business has its ups and downs. When things aren’t going smoothly, and things are tough, it’s easy for you and your staff to fall into a state of low morale. Low morale has it’s negative effects on business efficiency and success. For example, it can cause a lack of commitment, low productivity and a high turnover rate. And if you’re keen on running a successful business, you’ll want to stay well clear of these. If your business is currently going through a tough period, and you’re looking for ways to boost your employees’ moral during these tough times, read on. Here are 3 things you can do to help your employees regain their composure and face even the most difficult of times with confidence and keen determination. 1. Foster positive relationships among employees. Low spirits can come from not feeling connected in the work environment itself. Take a day away from the grind of work and try some employee relationship building exercises. This can be as simple as setting up ice breaker exercises at work where employees spend a little time getting to know one another. Or consider taking them out of the office for a while. Team building exercises such as a ropes course, or a camping trip can be an excellent way to foster positive relationships between your staff members, and help them reach out to others in the workplace when things are not going easy for them. 2. Create some office fun. It can be a drag going into an office where the work is pure repetition. Change things up a bit and get employees something to look forward to. Create a themed day where workers can come dressed in different attire. It can be something simple like casual Fridays, or allocating a day where everyone comes dressed in their favourite sport team colours. The point is to offer a change of pace and a little breathing room. Also, offer incentives to participate on these days, such as a weekly prize (chocolate and alcohol usually go down a treat) or the chance to go home early on Friday. Now, who wouldn’t want to participate in that! 3. Build an appreciation for the company. Employees who are excited and connected with their company are likely to be more productive and involved. Try educating your employees on different aspects of the business to give them some insight into how things are run. Take some time and teach them the history and vision of the company. If you can connect the company image with the employee and instill some pride, then it’s likely that they will be more excited for work. Beyond that offer them chances to be more involved and aware of how to work efficiently within the business. Use services such as those offered by axcelerate.com.au and help your employees learn to become more efficient and productive at work. 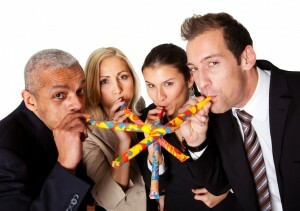 When things are tough, the best way to build employee spirits is to reinvigorate the excitement towards the business. Take some time and ask employees what they want to get out of work. Offer them incentives to be excited for work and foster relationships as a team. Show them that you want them to be productive and enjoy their work at the same time. An appreciation for the business and knowing that the business is trying to provide a fun environment will yield great results and keep employees up during those tough times.